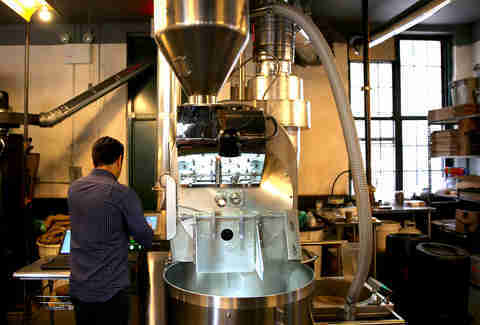 Birch isn't just one of the best local roasters in NYC -- with eight storefronts, including a brand-new location in the Bronx, it's also one of the fastest growing. Since 2009, the brand has expanded its reach from a single shop at 27th and Madison to outposts across Manhattan, the Bronx, and Queens. The secret to Birch's success? 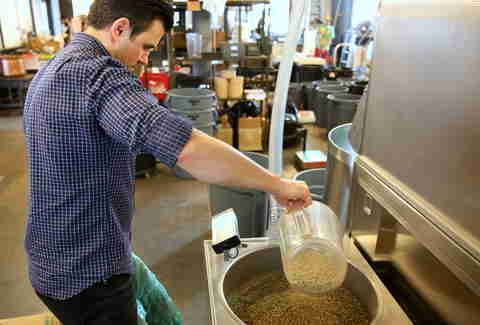 It simply boils down to quality control. Not only do co-founders Paul Schlader and Jeremy Lyman hope to make the global coffee industry more fair and sustainable by sourcing from specific micro farms that have proven track records of caring for their communities -- they also scrutinize these growers' beans. As the overseer of all of Birch's purchasing, and one of only about 3,500 Licensed Q Graders in the world, Schlader, in particular, pays an insane amount of attention to green coffee on a level that most coffee purveyors (especially larger chains) couldn't even try to fake. Simply put, the man is coffee obsessed. 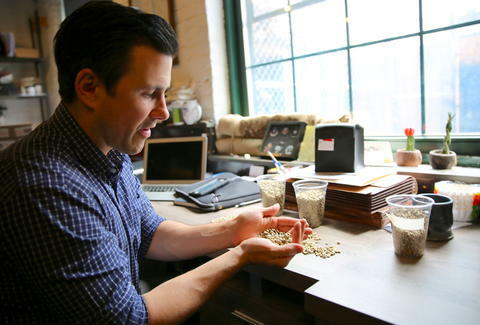 Meticulous selection and roasting is exactly what makes Birch's coffee so good -- which was apparent when I visited the roast house in Long Island City, where Schlader took me through the entire roasting process, step by step, from sorting raw beans to weighing the final product. Though usually done well in advance, Schlader shows me how coffee is graded. He explains that all flaws are divided into two categories: primary and secondary. A primary defect (e.g., a "full black" cherry that developed poorly or suffered from disease) rules out a bean, while a secondary defect (e.g., withering, insect infestation, etc.) won't disqualify it from use. 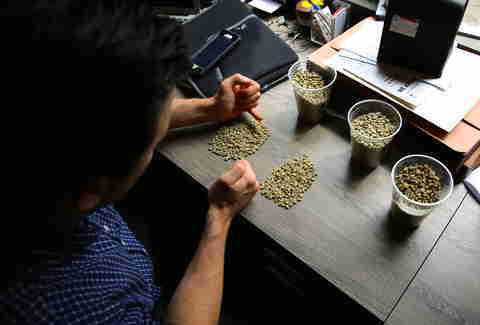 Depending on the number of defects, each batch of beans is given a grade out of 100. Any batch with a score greater than 80 is considered by the industry as "specialty," but Birch accepts no coffee graded below 84. Higher-graded coffee is more expensive, of course, but to Schlader, the quality is worth every penny. 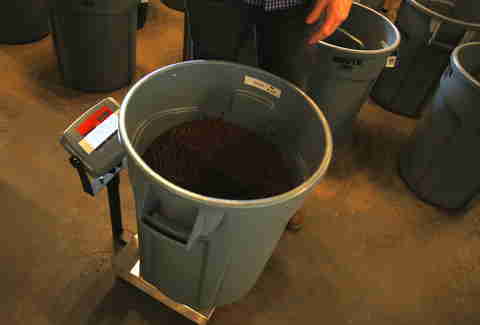 Schlader empties 50lbs of coffee, from a farm called Santa Ines in Carmo de Minas, Brazil, into the loader. 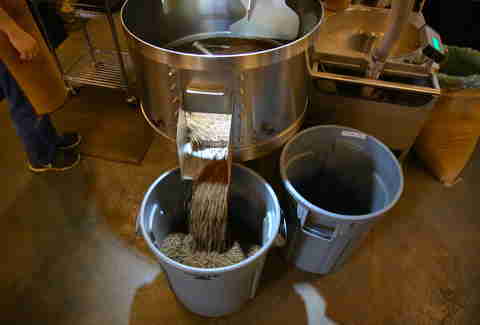 The beans are sucked up through a hose and loaded into the hopper. 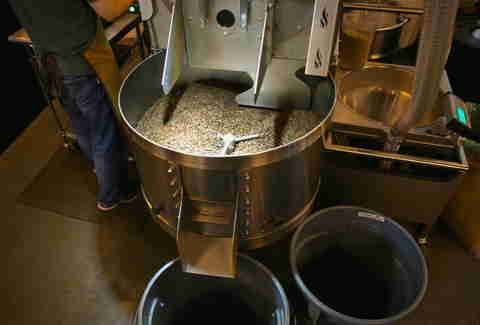 Schlader charges the roaster to a temperature of 370°F. All roast settings are stored in an app called Cropster, which records and saves individual coffee profiles. In this case, the Brazilian beans work well with an espresso roast profile. The coffee is then dropped into the roaster. It's on! 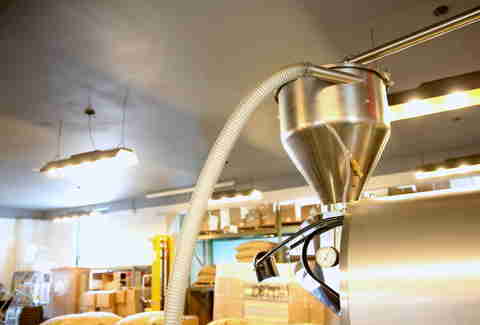 Birch uses low-pressure convection roasting, which requires less gas than drum roasting does. This technique generally gives the coffee less body and more acid -- and it also takes longer, and thus, costs more (which is why most larger roasters don't do it). As the temperature rises from 260-330°F, the beans turn whitish-yellow as they gradually dry out from 10% moisture to none. From 330-400°F, they begin to turn golden, due to the Maillard reaction (sugar browning) that occurs from the 6.5- to 9.5-minute mark. 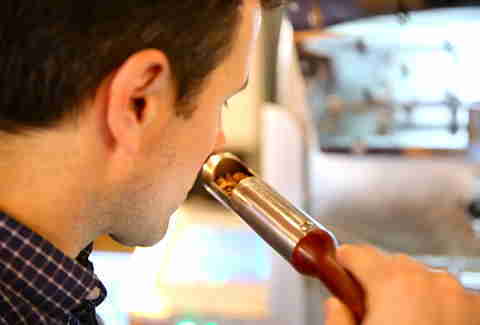 Schlader adds heat in incremental adjustments, as doing so too quickly can burn the coffee. 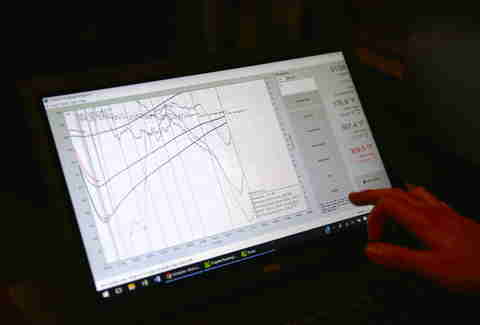 He uses Cropster to monitor the bean temperature (internal temp of bean), the inlet temperature (inside the roaster), and the return temperature (the machine's output). We pull a small sample from the batch to check the aroma. The aroma of peanuts indicates that the Maillard reaction is working well. At 400°F, the beans become brown as the Maillard reaction finishes, and the beans begin to smell like cocoa. 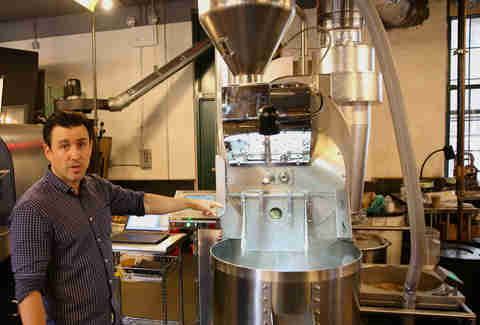 At 415°F, Schlader drops the coffee down another level, this time into a mixer. 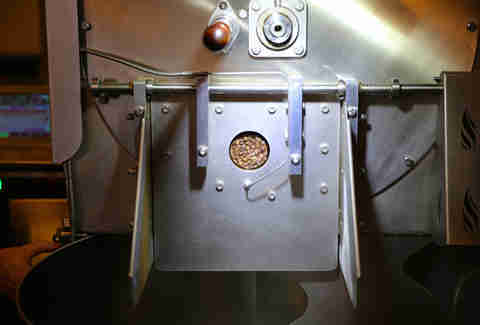 This stops the roasting process and allows the beans to begin to cool down. Air is sucked out of the chamber and exhausted as the beans are tossed around. Once the beans have cooled off, they are dropped one final level into a giant plastic container (OK, it's a sanitized trash can) for transport. 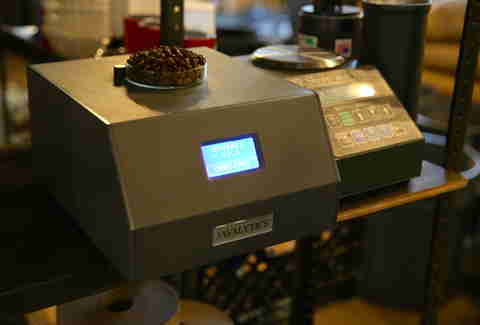 An Agtron is used to check the color of a sample of the beans, and confirm that the roast was dialed in properly. In reading the Agtron, the higher the number, the lighter the roast: anything greater than 70 is extremely light, and lower than 25 is extremely dark (perhaps even burnt). In this case, Schlader is looking for a 58-55, and he scores a 57.1, right on the money. Finally, he uses a scale to determine the final weight of the batch. Generally about 13% of bean weight is lost during roasting due to water evaporation, and this batch is no different. What started as 50lbs of coffee now weighs 42.86lbs. However, although these tasty beans are now roasted to perfection, they'll need a day's rest before they can be brewed. Doing so allows the coffee to de-gas, and release built up CO2 that would otherwise create an unpleasantly bubbly cup. And as I learned the next day, coffee this good is worth the wait. Ethan Fixell is a comedian and freelance beverage writer from New York City. Visit EthanFixell.com or follow him on Twitter: @EthanFixell.